Create lists to classify your clients or potential customers, to send text messages quickly to groups with the same interests. You can also capture easily customers’ phone number in its contact agenda and access to a great logging and reporting of messages. Texting is a great addition for any salesperson. 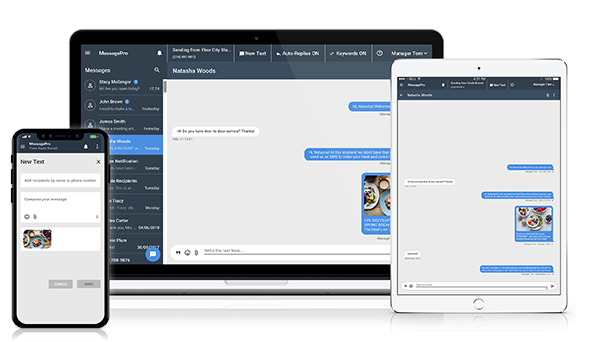 MessagePro’s versatility in handling automatic replies, managing message flows, and assignments of personnel to specific phone numbers provided the flexibility we needed. Texting often gets immediate responses and more easily leads to phone calls, making it indispensable for sales work. We are working with MessagePro on integration with our CMR solution. I prefer to be able to review the sales team’s text interactions with their clients and prospects. When our sales team is using their personal cell phones and their own text messaging, I never see it. Now I can easily see how things are going. Want to Know More About MessagePro for Sales? Let’s Talk!